Fiery Holes, Moxley, 1959, via Bilston Online. Click for link. I love an evocative placename, and they hardly get more redolent than Fiery Holes, a lost settlement that lives on only in the name of the pub on its site, now more famous as the gathering point for the Black Country’s pony-and-trap drivers. The site is just to the West of Moxley, itself only a small Black Country village that’s now little more than a blink-and-you’ll-miss-it stop on the New Road near Darlaston. It’s a very typical Black Country village though, right in the heart of the mineral seams – in fact, one David Rose in the nineteenth century operated not only a colliery on his Victoria and Albert site in Moxley, but an ironstone mine and ironworks, fireclay pit and brickworks, producing 20,000 tons of pig iron in 1852. Fiery Holes, OS First Edition 1887. © Crown Copyright and Landmark Information Group Limited 2014. All rights reserved. 1887. The OS first edition shows Fiery Holes as a group of houses and some sort of industrial working, surrounded by acres of rough ground dotted with old shafts, pits, quarries and other industrial detritus. 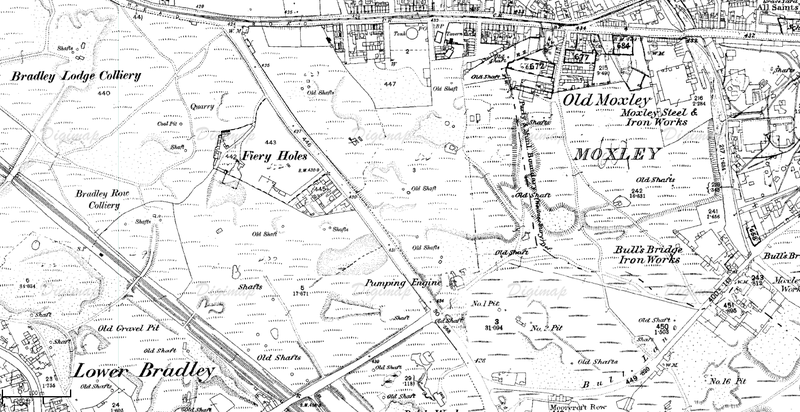 By the time this map was published in 1887, the principle collieries in the area were the Bradley Row, Bradley Lodge with all the Moxley works in the village and a disused brickworks near Bradley & Moxley GWR station constituting the local industry. However, the Black Country became what it was way before this first Survey – none other than John “Iron Mad” Wilkinson founded the Bradley Ironworks at Fiery Holes in around 1766 at the junction of Bradley Lane and Great Bridge Road, the beginnings of a massive venture which saw him labelled the father of the South Staffordshire iron industry. 100 years later and there’s scant evidence of Wilkinson on the ground, the land having been dug up for other ventures, railways and so on. Still though, the collieries keep on mining the ten yard seam of Black Country coal for some years yet, and it’s from this that Fiery Holes gets its name. Whether your seam of coal is 30 feet or 30 inches wide, getting to it has always had its difficulties. Wilkinson most likely brought in a Newcomen engine to deal with one of the problems – the high midland water table and its attendant mine-flooding tendencies. Another issue is how you then get the coal out, and here is where the Black Country is a particularly important case study. As one of the first areas to embark on mass, industrial-scale mineral extraction, lots of mistakes were made – the methods used to extract the apparently limitless coal were often wasteful and inefficient, meaning that the Black Country was also one of the first coal mining areas in the UK to become unprofitable to work in the late nineteenth century. Geology was as much an infant science as its application in mining, and mistakes learnt here were used to benefit other parts of the country later. The thickness of the famous South Staffs seam caused problems in itself – efficient techniques from Shropshire were not applicable, so miners had to use the “pillar and stall” method, which extracted about half the coal as saleable lump coal, leaving the remainder as working platforms, supporting pillars and other “slack”. And the mineral content of the Black Country coal played its part – a high sulphur content meant that spontaneous seam fires broke out regularly, when the underground gases reacted with some sort of combustion. These are still a hazard in modern mining – a mine fire in Centralia, Pennsylvania has been smouldering since 1962! Nothing much could be done, and nothing much was done – the miners just abandoned that area to the fire (including wasting lots of perfectly good coal) and moved elsewhere. One of the worst affected areas for these fires was – you’ve guessed it – the area between Bradley, Bilston and Moxley that became known as Fiery Holes. Smoke and steam would escape from the ground as in the wonderful pictures below, leaving the ground warm to walk on, and I’m guessing with a pretty unpleasant aroma. In Minnie Page’s back garden, Moxley 1956, smoke escapes from an underground coal fire. Fiery Holes near Wednesbury, courtesy of Mike Maynard. Click for link. The picture at the top of this post shows the Fiery Holes site in 1959, yet more of the Black Country’s post-industrial – and in particular, post-extraction – derelict landscape. Years to come would see the short road named Belmont Street; the inter-war semis of Harrowby Street, Lodge Road and Jubilee Road come to surround the site to the North; the eventual conversion of Wilkinson’s land into a playing field; the demolition of the few houses to make way for the Traveller’s Rest pub; the closure of the GWR line and its subsequent re-opening as the Midland Metro; and just recently the demolition of the 1930s housing to make way for 231 new homes (interestingly, by the same group that are building in Coalpool). That’s the thing about the Black Country landscape – old and storied as it is, it’s always changing. The land where the smoke is coming from in that last picture is now part of King’s Hill Park. They had the Darlaston Fun Day on the other side last month. That picture was in fact printed backwards! That’s Old Park Road and as you go up the hill, those cottages are on the left, not the right as shown in the picture! Very interesting article about a place I have passed several times and had not realised the past history. I have a problem with the assertion that the efficient techniques from Shropshire were not applicable to the thick coal of South Staffs. Can “longwall” be attributed to Shropshire, and could it be applicable to the thick coal? The Cannock Chase Mining History Society, in their book on the history of the Cannock Chase coalfields, describe the Pillar and Stall method and say that it was in almost universal use for the next 100 years until the middle of the 19th Century. They add that due to the lack of work in Shropshire their miners came in search of work in S Staffs where there was great demand and high wages. They brought with them a new technique of winning coal known as the “Shropshire Method”, later excepted as “longwall stall work”…..this method of working was to become adopted in all the Cannock Chase pits before long. “The details of working would form an endless variety; but the leading principles may be classified under two heads…pillar and stall and longwall working…(longwall) has prevailed extensively in all parts of Scotland in the neighbourhood of Edinburgh and also the West of Scotland…may be said to be universally applied to the working of ironstone…. The Mines Inspectorate was set up in 1850 and in 1857 the Inspector for South Staffs and East Worcs, Mr Brough, gave his annual report with particular reference to the 88 deaths due to coal and roof falls. I’ll have to defer to you here – my knowledge of mining techniques is secondhand at best! A curse greater even than the butty, however, was the almost universally adopted method of working the coal, known as Pillar and Stall….. This was extremely hazardous….. In addition to being highly dangerous, pillar and stall is extremely wasteful since little more than 50% of the coal could be got, the rest remaining as pillars…. …. For reasons of economy and safety, therefore, it was constantly urged throughout the 19th century that pillar and stall be abandoned and that the coal should be got by longwall. …. William Matthews, a Dudley ironmaster said that the larger yield from longwall might sell for less than the bigger coal by pillar and stall, but he maintained that the real reason why pillar and stall persisted was that royalty was based on the selling price of coal, and that the proprietors inserted in most leases an express stipulation that coal should be worked pillar and stall which yielded the highest amount of royalty. My great grandfather was George Callaway/Calloway. For a time, he lived in one of the small Fiery Holes group of houses from where he started the Traveller’s Rest beer house. This, later, became the larger pub but down the road a few yards. The Black Country Bugle reports him being landlord of the larger pub in 1870. It was later sold but was managed by two of his daughters. He also had a building business and was responsible for building many domestic properties in Moxley, Tipton and Darlaston.